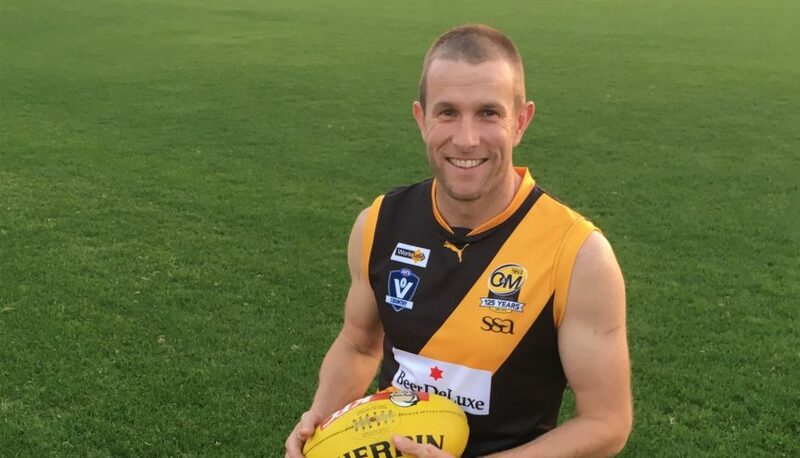 After what can only be described as a ‘roaring success’ of a year both on and off the field, the Albury Tigers have notched up yet another premiership while their sports ground presented itself throughout 2018 in absolutely superb condition. Situated near the NSW bank of the Murray River, Albury Sports Ground is home to the oldest Australian Rules club in the Ovens and Murray Football League. With a tradition stretching back to 1876, the Tigers are an integral part of the local community and so it’s with great pride that Albury Tigers Co-Coach, Chris Hyde, speaks about the club and its facilities. 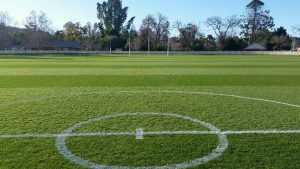 He believes this year the Albury Sports Ground supported the best playing surface in the competition and arguably one of the best in Australia. The excellent turf surface is a fitting reward for Groundsman, Troy Shepherd, who has done an exceptional job renovating the oval with Heritage Seeds (Barenbrug/Nuturf) blend Striker Gold. 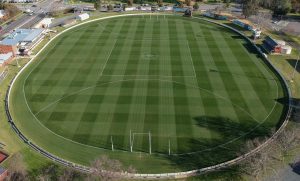 In 2017 Albury Sports Ground changed the main oval’s seed mix to varieties based on Mediterranean ryegrass genetics. The results were less than ideal with mediocre establishment, bare areas and wear issues throughout the season. Fortunately, though, during the winter of 2017 Troy talked with Matthew Merrick and trialled ‘Striker Gold’ in some warm-up areas that endured a lot of heavy traffic. Matthew is Heritage Seeds’ Portfolio Manager – Turf. From that trial Troy made the decision to change back to Heritage Seed turf seed in 2018 and the ground has never looked better! Striker Gold is aimed at premium sports surfaces. It is an elite blend of ryegrasses containing three of the best Continental varieties – Premier 2, Derby Xtreme and Barorlando ryegrass. Mr Merrick said in 2019, Premier 2 will be replaced with Premier 3. Premier 3 is the latest product to come out of the Barenbrug breeding program and responds to customer demand for a good-looking, dense turf with proven wear tolerance for use on high-traffic sporting arenas. These Continental ryegrasses are significant improvement over previous commercial varieties of turf-type perennial ryegrass and Mediterranean genetics. “This year we went to Striker Gold because we gave the Mediterranean perennial ryegrass a shot last year, just to see how it compared with the Continental blend, and it just didn’t compare,” Troy said. “It just didn’t have the colour and the wear probably wasn’t as good as the Continental Striker Gold blend this year. “We’re very happy with the Striker Gold colour and recovery has been excellent after the games. After more than 20 frosts this year it held up very well. “Once the striker Gold got going it out competed weeds like Poa annua and had really good resistance to fungal disease and insects as well. “I’ve been here for three seasons and this is the best year. Turf recovery after games has been quick and there was a 70 per cent reduction in sand and seed divot fixing. “As far as overall wear goes it held up really well, especially in the goal to goal corridor and centre circle. Troy said he over-sows seed in mid-February when the temperatures are warm to promote germination and early growth. This year’s establishment included a mid-February cut to 12mm and solid tine verti-drain. After the verti-drain contractors came in and scarified the oval in two directions to open up the surface and prepare the seed bed for the best seed/soil contact. All the thatch was removed. Seed was put out with a speed seeder and the seed dropped in behind the spike as well as into the verti-drain holes. Striker Gold was put down, top dressed with sand and rubbed in, followed by an application of starter fertiliser.